Welcome to Day 28 of 31 Ways to Embrace Lopsided Living! I’ve learned a lot since I first started practicing this idea of Lopsided Living almost ten years ago. And one thing I know for certain — I often experience times of great success in living life this way and there have been seasons when I have known nothing but epic failure. Why am I telling you this? I mean, you’re reading because you want to know this is doable and you can actually have the abundant life God offers every day, right? Well, you can. But … the truth is, just because we can, doesn’t mean we will. We’ll have seasons when we get off track. It can happen for a thousand different reasons. But here’s the thing — I’ve learned the best way to get back on track and that’s what I want to share with you today. I’m a list maker. I can’t help it. I have lists for everything. But here’s the thing — most of my lists are temporary. And on and on … these lists don’t last. I can write them on sticky notes with pencil because they aren’t permanent. But today, I want to share with you two lists that will last. 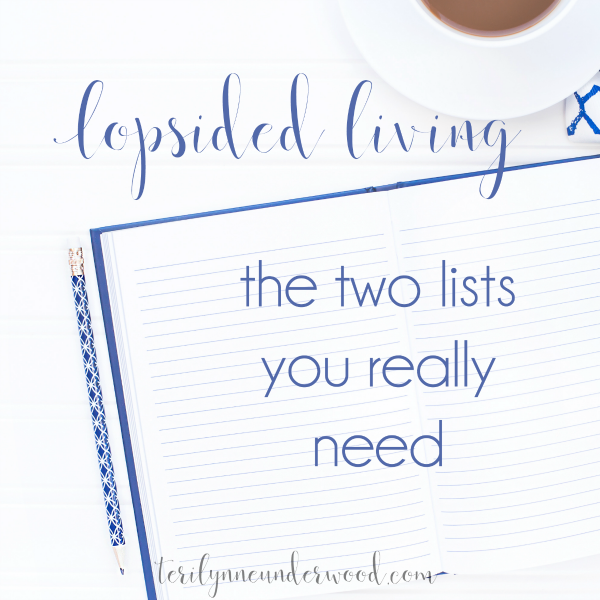 And these are the two lists that will help you when you veer away from lopsided living and want to find your way back. Like basically everyone in North America, I’ve read Ann Voskamp’s book, One Thousand Gifts. And for a couple of years I tried tracking all the little gifts of grace I noticed in my life. But the truth is, that wasn’t a practical long-term plan for me. Mostly because I felt silly writing “coffee” on the list every single day, even though I am enormously thankful for coffee every day. What has worked for me, for almost twenty years, is taking time on Saturday afternoon or Sunday morning to record a list of the things I’m thankful for over the past week. I try to do this before going to church on Sunday mornings because I’ve found it helps me focus on worshiping God and not wanting the songs to be my preference when I’ve spent time recognizing all the ways God has met me and all the things He has done for me beforehand. 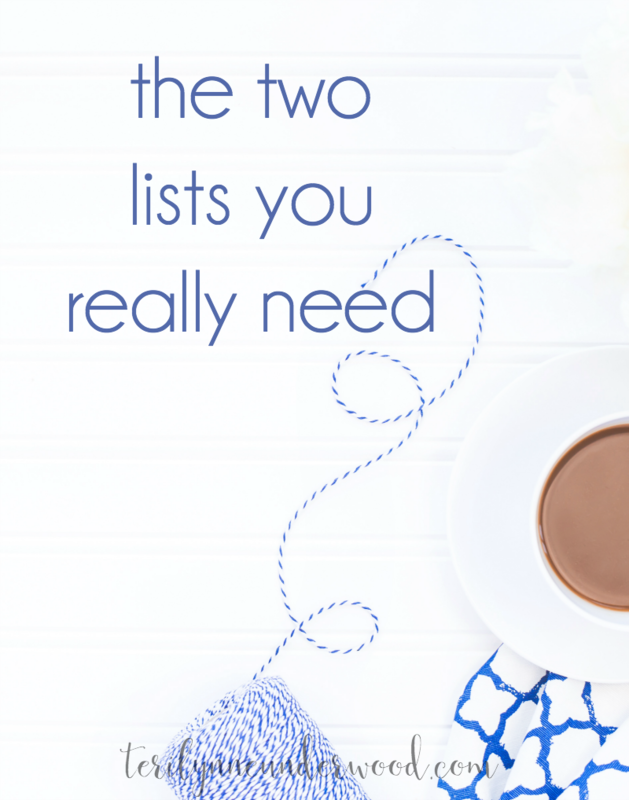 This list doesn’t have to be any length or in any format. In fact, I have a friend who scrolls through her Instagram feed on Sundays (or any other time she’s feeling discontent or frustrated with life) to remind herself of the innumerable gifts God has given her. We need to keep a record of our gratitude. Someway, somehow. The other important list I keep is a record of what God is teaching me. For me, this is part of my journaling as I do my quiet times in the mornings. Again, I don’t think the particulars of HOW you do this are nearly as important as actually DOING it. When we can go back through our journals or Bibles or notes on our iPhones and be reminded of the lessons God has taught us, the times He has been faithful to us, the struggles we have overcome through His strength, the blessings He has lavished on us, it gives us a powerful arsenal against the enemy who wants to tell us to give up or that we’ll never really change or that God isn’t paying attention to us. Whether you do it on your phone or in a fancy journal or (like me) in a five-subject notebook, take time to record at least five things you are thankful for and at least two lessons God has taught you or times He has been faithful to you. I’d love for you to share in the comments something you are thankful for today … let’s count our blessings together! Grace Is for Everyone — even yourself! I’m thankful for being a mom. I’m thankful for the differences in my kids, the challenges in parenting them well, and the joy in doing life with them. Being a mom has definitely kept me close to the Lord. Love this! Being a mom is such an awesome gift, right? ?